1 of 3 Heat oven to 350 degrees F. Place 12 paper liners in cups of oversize cupcake pan (each cup 3-1/2 x 2 inches). Sift flour, powder, soda and salt into bowl. Mix sour cream, milk, concentrate, lemon rind and juice, and orange rind in small bowl. 3 of 3 Bake in 350 degree oven 30 minutes, or until pick tests almost clean. Remove from pan to rack to cool. 1 of 1 Beat butter, shortening, confectioners' sugar, milk, extract in bowl until smooth, 3 minutes. Forget-Me-Nots: Tint 2 cups frosting pink; 2 cups purple; 1 cup of remaining frosting green. Fill pastry bag fitted with coupler with pink frosting; fill second bag with coupler with purple. Fit small bag with small leaf tip (#67); fill with green frosting. Cut out 120 two-inch parchment or waxed-paper squares Attach petal tip (#101) to coupler for pink frosting. Attach paper to flower nail with frosting. Hold bag with right hand at 45 degree angle, with wide end of tip toward center of square. Squeeze bag lightly; move tip toward edge of paper for first petal. Turn nail counterclockwise; relax pressure; bring tip back to starting point. Stop squeezing, lifting tip away. Repeat, forming 3 or 4 more petals. Press yellow candy in flower center. Transfer flower on paper to baking sheet. Repeat for 59 more flowers. Repeat with purple frosting to make 60 flowers. Freeze flowers. Cover cupcakes with thin layer of remaining white frosting. Place frozen flowers, removing paper, on cupcakes. Use green frosting to fill openings between flowers with leaves: Hold tip at 45 degree angle, with small opening pointing up. Gently squeeze, pulling tip away from surface. Stop squeezing; release. Yellow Apple Blossoms: Tint 3-3/4 cups frosting yellow; 1/2 cup light blue to match candy centers; 3/4 cup of remaining frosting green. Fit bag with large petal tip (#104); fill with yellow frosting. Fit small bag with small round tip; fill with blue frosting. Fit second small bag with small leaf tip (#67); fill with green frosting. Follow directions for Forget-Me-Nots. Pipe dot of blue frosting in flower center; attach blue candy. 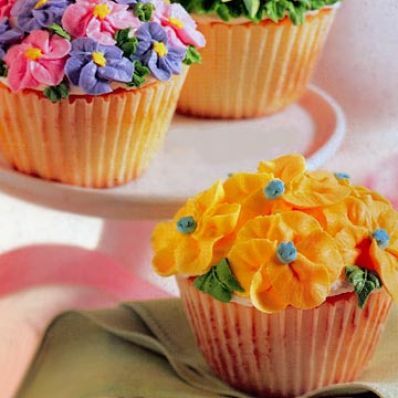 Make 6 to 8 flowers per cupcake. Freeze and decorate with flowers and leaves as above for Forget-Me-Nots. Zinnias: Tint 2 cups frosting yellow; 2 cups blue; 1 cup remaining frosting green. Fit large bag with large leaf tip (#366); holding bag in one hand, scoop yellow frosting onto one side of bag. Fill other side with blue frosting. Gently squeeze until both colors are visible through tip. Fit second bag with medium leaf tip (#67); fill with green frosting. Cover cupcakes with thin layer white frosting. Using green frosting, pipe rim of leaves around top-outside edge of cupcakes. Using yellow-blue-filled bag, hold tip with open points facing to sides. Apply firm pressure for base of petal; relax pressure and pull bag toward you, drawing petal to a point at edge of cupcake. Stop squeezing, and lift away. Continue around cupcake in concentric layers. Fill flower center with sugar candies. Makes one dozen cupcakes.